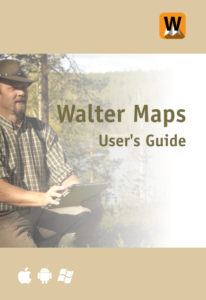 Download your copy of Walter Maps User’s Guide here! For the Shape format, ordinary TIFF, GeoTIFF, and JPEG, only projected coordinate systems (i.e. X and Y coordinates and not Latitude and Longitude coordinates) are valid and all the layers in the map must share the same projected coordinate system. Layers lacking coordinate systems will inherit the presently used coordinate system in Walter Maps. For WMS/WMTS layers, both projected coordinate systems (i.e. X,Y coordinates) and geographic coordinate systems (i.e. Latitude, Longitiude coordinates) are valid. Walter Maps Free and Pro supports viewing of online web map services. In Walter Maps Pro you can export these to offline rasters in GeoTIFF format. The connection to the specific web map server is made through a local service description XML file. The format of the WMS and WMTS xml files is described in the extrernal GDAL links link 1 and link 2 respectively. In Walter Maps the xml is saved as *.wmwmx (Walter Maps web map xml). You can download the USGS Topological Map *.wmwmx file from topographic_map_of_usa.wm_layer.zip. In Walter Maps Pro you can also open the link directly from an URL download. You can download the USGS Arial imagery *.wmwmx file from usgs_imagery_only.wm_layer.zip. In Walter Maps Pro you can also open the link directly from an URL download. New Orleans, Louisiana (LA), USA. 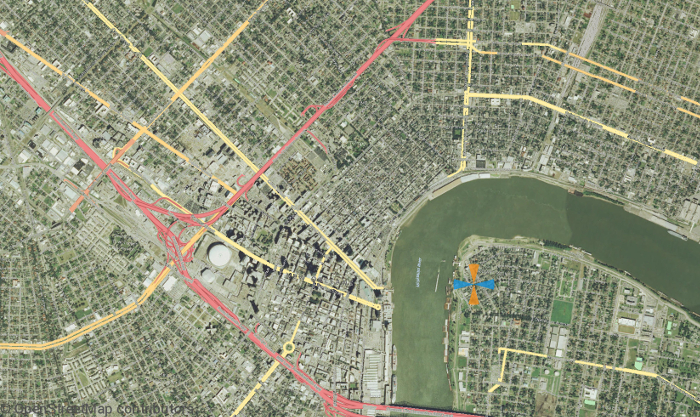 Open street map tiles overlaid on top of the USGS aerial imagery. Walter Maps map package is a compressed zip-file containg all your map layers in the map, all layer symbologies, all media files (images, videos), projection information, and all user symbols. In Walter Maps, when saving all your layers to dropbox, device (applicable to Android devices only), or to e-mail, a map package will automatically be created and saved. The saved map package can be opened from dropbox, your device (applicable to Android devices only), and from an URL-link (Walter Maps Pro only). Any map package produced by Walter Maps Pro (or Free) can be opened in Walter Maps Free (and Pro, of course). The Walter Maps map package is an open format, i.e. you can produce your own map packages in your own system. 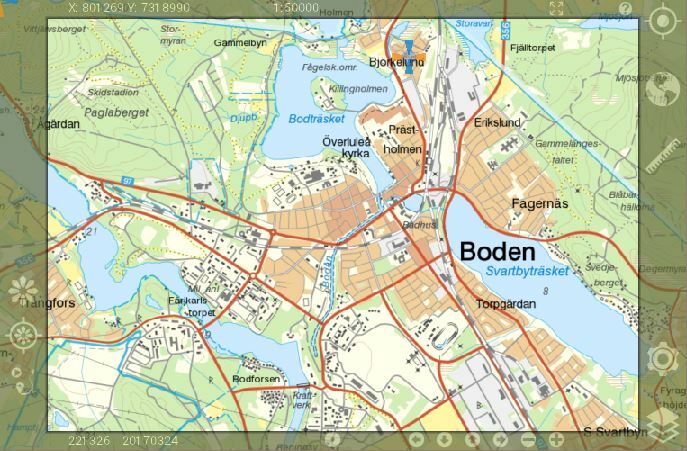 Please, see the section “Advanced – Building your own Walter Maps map packages” below for more information. Walter Maps layer package is a simple compressed zip-file containg one or more map layers and their required files. You can easily produce your own layer packages by compressing all required files to the root of a zip file. Layer packages containing other files not recognized as map layers will not be opened at all by Walter Maps. In Walter Maps, when saving one of your layers to dropbox, device (applicable to Android devices only), or to e-mail, a layer package will automatically be created and saved. The saved layer package can be opened from dropbox, your device (applicable to Android devices only), and from an URL-link (Walter Maps Pro only). Any layer package produced by Walter Maps Pro (or Free) can be opened i Walter Maps Free (and Pro, of course). Walter Maps symbol package is a simple compressed zip-file containg one or more svg files. You can easily produce your own symbol packages by compressing all svg files to the root of a zip file. Symbol packages containing other files not recognized as svg files will not be opened at all by Walter Maps. The symbol packages can be opened from dropbox, your device (applicable to Android devices only), and from an URL-link (Walter Maps Pro only). Walter Maps language files are simple text files, defining all text strings in Walter Maps in different languages. I you want to create your own language files, please follow the guidelines provided in the section “Advanced – Creating your own langauage files” below. The Walter Maps langauage files can be opened from Dropbox or from your device (applicable to Android devices only). Walter Maps is a simple semi-colon separated text file for importing point features (point geometries and their attributes) to a point shape file. All field names and values must be separated by semi colons “;”. Field names should not be longer that 8 characters and should be built from the characters “A-Z”, “a-z”, “_”, and “0-9”. The number of semi colons per row must allways be equal to (number of fields -1), even for rows with missing values. All floating point numbers shall use “.” as decimal delimiter. The first row consists of unique field names. There must exist one Y and one X field (both upper and lower case allowed). There must not exist any row with missing X and Y values. Missing values are allowed for other fields than the X and Y fields. No other existing map layer in Walter Maps must have the same base name as the file you are about to import. If the length of a text fields exceeds 253 characters, the text field will be shortened to 253 characters. These files can only be imported from Dropbox, your device (applicable to Android devices only) and from URL downloads. 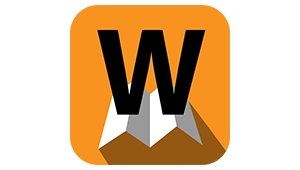 You can download the above example file example from example.wmtxt. You can also open the link directly from an URL download in Walter Maps. Files in Walter Maps point text format (*.wmtxt) can neither be included in Walter Maps map packages *.wm_map.zip, nor in Walter Maps layer packages *.wm_layer.zip. All vector layers in Walter Maps, even line and polygon layers, can be exported to Walter Maps text format (*.wmtxt). The vector layers can be exported to Dropbox, your device (applicable to Android devices only), or to e-mail. As X and Y values, the centroid (mid point) is calculated for each geometry. The centroid is guaranteed to be within or on the boundary of each geometry. For line and polygon layers, no geometry is exported, beside the centroid (mid point). All vector layers in Walter Maps, even line and polygon layers, can be exported to Excel format (*.xls). The structure of the xls-file is the same as for the Walter Maps point text format above. The vector layers can be exported to Dropbox, your device (applicable to Android devices only), or to e-mail. Walter Maps can easily be used as a field data collection tool for entrepreneurs, organizations and systems in need of that. Through our open and well documented map package format and map document format, you can easily create your own collection of maps for distribution to your collegues, partners, customers, and friends. Of course, you can use Walter Maps to produce your map packages, but sometimes you migth want produce the map packages automatically from your own systems. The formats for the map package and the map document are based on open standards, i.e. it is based on the zip-file format, ordinary text files, and JSON text files. The map package consits of a single zip file where you put all your map layers and other needed configuration files. You don´t need to read this manual section if you are not going to build your own Walter Maps map packages. In the end of this section you will find a link with c++ source code for saving and loading the Walter Maps map document in JSON-format. Of course, you can use your own language of choice for reading and saving JSON-files. The Walter Maps map document is built to cope with future expansions, i.e. a lot of fields in the map document are not used for the moment. Only few and small future format changes will therefore occure. Your efforts for coding your own map package creation routines will therefore not be in vain, not now and not for the future. The map package should always end with *.wm_map.zip in order to be recognized by Walter Maps. When exporting a map package from Walter Maps it will always be named like WALTERMAPS_20170323_123838.wm_map.zip, i.e. it will be named by the current device date and time. When producing your own map packages, you can name it differently as long as it ends with *.wm_map.zip. The required and optional files above shall all be placed in the root of the compressed map package zip file. Lets start with the file waltermapsdeviceprojection.txt. This file only contains a single line of text, identifying the currently used projected coordinate system. As text string you should use the human readable EPSG string identifier (i.e. do not use the EPSG numerical ID). For example, the file waltermapsdeviceprojection.txt can contain the string “sweref99 tm” or “nad83(harn) / new york central” (without quotation marks). For a full list of projected coordinate systems please visit http://spatialreference.org/. In the examles below, comments will be added after two slashes “//” even though they are not valid comments in json files. Manadatory fields will be marked with M, non used fields for future expansion will be marked with F, valid ranges vill be given after letter R, and default mandatory values will be given after letter D. The only valid data types are integer (e.g. 3 or 48), double (e.g. 3.14159265), boolean (i.e. true/false), or string. Max and Min below denotes the maximum and minimum value for the present data type. "m_epsg": "" // Projected coord system string, M, F, D:""
The simple example above makes actually no sense since your map package should contain at least one map layer. When developing your json file export you can verify your json-file against the schema file waltermapsdoc_schema.json. Verification can be made at http://www.jsonschemavalidator.net/. There you paste the schema to the left and your json file to the right. 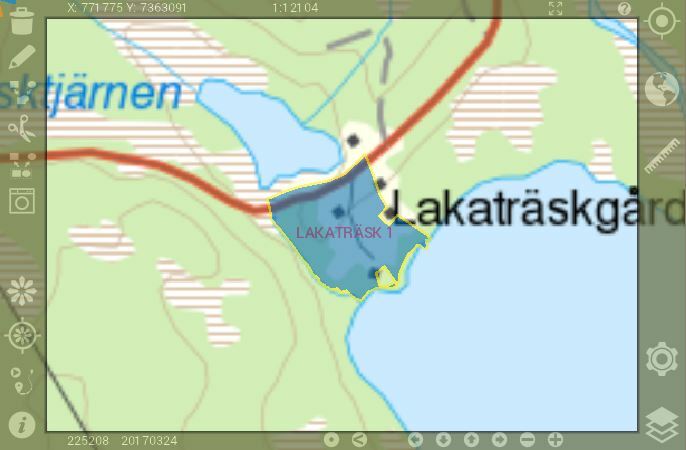 The map package for example 1 can be downloaded from http://waltermaps.com/wp-content/tutorials/waltermaps_map_package_and_document_format/map_package_1_raster.wm_map.zip. The map package can also be directly opened in Walter Maps Pro through direct URL download. The map in example 1 looks like below and contains only one GeoTiff raster called topomap.tif. The symbology definition (WaltermapsLayerSymbology section in the json file below) for rasters and vector layers are exactly the same. Even though some of the fields only are valid for raster layers and vice versa, they shall not be omitted in the json document in any case. // Note that the DOS/Windows back slash path delimiter "\"
// is not allowed, not even escaped like "\\"
“m_labelColors”: [ // Array of label colors. 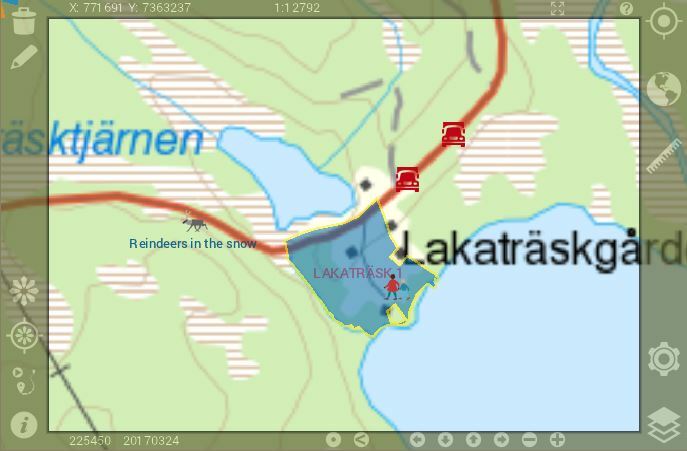 The map package for example 2 can be downloaded from http://waltermaps.com/wp-content/tutorials/waltermaps_map_package_and_document_format/map_package_1_raster_1_vector.wm_map.zip. The map package can also be directly opened in Walter Maps Pro through direct URL download. The map in example 2 looks like below and contains one GeoTiff raster called topomap.tif and a vector polygon layer called estate.shp. “m_selectionQuery”:””, // No selection query is set, i.e. http://waltermaps.com/wp-content/tutorials/waltermaps_map_package_and_document_format/map_package_1_raster_2_vector_multiple_symbology.wm_map.zip. The map package can also be directly opened in Walter Maps Pro through direct URL download. The map in example 3 looks like below and contains one GeoTiff raster called topomap.tif, one polygon vector layer estate,shp, and one vector point layer POI.shp. In this example multiple symbology for the point layer, i.e. depending one or more particular field values the vector point file is symbolised in more than one fashion. In this particular case the field “TYPE” in the poi.shp file is symbolised i three ways depending on the field values (‘FRIENDS’;’TRUCK’;’REINDEER’). Three SVG-symbols are used for the symbology. Two of the, user_symbols/reindeer.svg and user_symbols/friends.svg, are user defined symbols. All the user defined symbols must be stored in the map package zip file in the folder user_symbols. In this example two media files, album/POI/560e4475-fa62-45a7-bde3-006538afc21c/WM_20170424_203521.jpg and album/POI/51746716-3ec5-44cf-8fc3-6075c69e02b8/WM_20170424_203433.mp4 are paired with two of the points, the most southern truck and the reindeer respectively. In order to pair a media files with a particular point, line, or polygon, the vector layer has to have a string field named “UUID” . For the particular point, line, or polygon, the field “UUID” has to be filled with a unique value (preferably fill with a UUID). The media files should be stored in a folder with a name built from “album“, the base name of the particular vector file (e.g. “POI” from the file name POI.shp), and the field value of the UUID field (e.g. “560e4475-fa62-45a7-bde3-006538afc21c“). The resulting path for the media file will be album/POI/560e4475-fa62-45a7-bde3-006538afc21c/WM_20170424_203521.jpg . The actual media file does not necessarily be named like WM_20170424_203521.jpg. Any valid file name will do fine. From this link you can download a single c++ header file, implementing saving and loading of the Walter Maps map document. The code is only dependent on the small and efficient ESJ library (extremely simple JSON for C++). The code can be used directly in your c++ project, or it can serve as pseudo code for your programming language of choice. In this video tutorial we will show you how to translate Walter Maps into your own language. For translating, you need the english language file english.lang to start with. You can download it here. For editing multi-lingual text files you need a text editor supporting that. We usually use BabelPad for that purpose. Babelpad can be downloaded here. When editing attributes in Walter Maps, your field names and values are visible in a scroll list view. The only built-in validations while changing or adding values are that you can’t add non-numerical strings to number fields and you can’t add floating point numbers into integer number fields. In many field data collection scenarios you want to guarantee the quality of the data that are collected, e.g. you don’t want to forget data collection for certain fields and you only want to collect values within specific intervals. In Walter Maps Pro it is easy to add that functionality by adding a rule-file to your shape file. If your shape file is called parcels.shp your rule-file should be called parcels.rul. The rule file cannot be created within Walter Maps. This is something you have to create in an ordinary text editor. The rule file is a text file in JSON format and must be coded in ANSI 8-bit text format (for now, UTF-8 text files are not supported). An example (parcels.rul) is shown below. The first key “attributes” is a value-array of the fields in your shape file that you want to be effected by your rules. Fields that you don´t want to apply rules for, should not be listed in the “attributes” value-array. The field/attrubite names are case sensitive, i.e. the field/attribute names in the rule file must exactly match the names in the corresponding dbf file. The next keys “UUID”, “REF” etc, are the actual rules for each field. The rules are implemented as JSON key:value pairs. All keys and values must be text strings and must be surrounded by double quotes, except for the boolean values true and false. unique (true/false) if true the field value must be unique. The check is performed when editing/adding attribute values. This is not checked when editing your geometries, e.g. while splitting a polygon. Default false. modifiable (true/false) if false the field value can not be modified once set. Default true. editable (true/false) if false the field is visible but not changable. Default true. not_null (true/false) if true the field cannot be empty. Only applicable to text fields. Default false. not_zero (true/false) if true a number field cannot be empty or cannot be 0. Default false. If a field is not set, you can specify what default value that field should be assigned. The key is default and the value can be a number, a string, or a default value auto-assigner, i.e. the values starting with waltermaps_ in the above example. As mentioned earlier, even the number values must be surrounded by double quotes. The above rule file example can be downloaded here. The JSON-file must be coded in ANSI 8-bit text format (for now, UTF-8 text files are not supported). Structural validation of your rules can be made at https://jsonlint.com/ . Once validated at https://jsonlint.com/ you should validate the functionality in Walter Maps Pro.